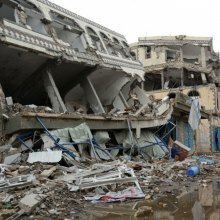 Reiterating that attacks targeting civilians are prohibited under international law, the United Nations human rights office confirmed dozens of casualties in airstrikes on villages near the capital, Sana'a. Briefing journalists in Geneva, a spokesperson for the Office of the High Commissioners for Human Rights (OHCHR), Liz Throssell, said one of the airstrikes on 23 August hit the Istirahat Al Shahab hotel in Bayt Al Athri in Arhab district, destroying the second floor and seriously damaging the rest of the building. “So far we have been able to confirm that 33 civilians were killed and another 25 injured in the attack,” Ms. Throssell said of the attack, which is being blamed on Coalition Forces. OHCHR said the attack came moments after an airstrike on a nearby security checkpoint manned by the Houthis. There were no reported casualties in that earlier attack. Also on 23 August, an airstrike by Coalition Forces hit a house near a Houthi security checkpoint in a neighbouring district, killing six civilians and injuring at least 13 others. “In all these cases, in which civilians were killed and injured, witnesses said that there had been no warnings that an attack was imminent,” Ms. Throssell said. Speaking on behalf of OHCHR, the spokesperson said attacks targeting civilians or civilian objects are prohibited under international humanitarian law, which also prohibits indiscriminate or disproportionate attacks. “We remind all parties to the conflict, including the Coalition, of their duty to ensure full respect for international humanitarian law,” said Ms. Throssell. OHCHR is urging the relevant authorities to probe the attacks in “credible, comprehensive and impartial” investigations. “This week's total is more than the number of civilians killed in the whole of June, when 52 were killed and in July, which saw 57 civilian deaths,” the spokesperson said.